Scientific context Glendanamycin (GA), a benzoquinone ansamycin antibiotic, interferes with the action of Hsp90 leading to degradation of Hsp90 client proteins. GA itself however has undesirable properties such as poor aqueous solubility and liver toxicity; therefore, numerous analogs have been synthesized, such as 17-AAG(1). 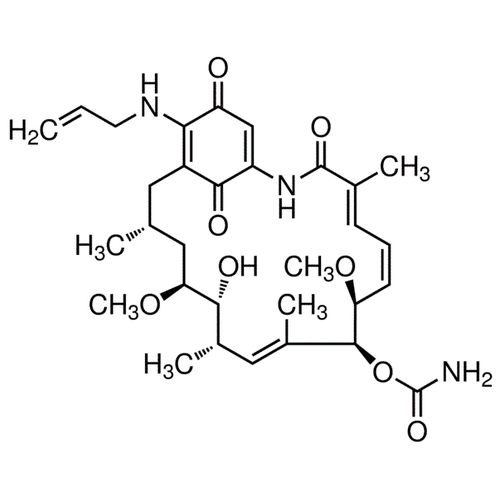 17-AAG is an HSP-90 inhibitor that displays a 100-fold higher affinity for HSP-90 derived from tumor cells compared to HSP-90 from normal cells(2). 17-AAG inhibits Akt activation and expression in tumors and synergizes with a number of antitumor agents such as taxol(3), cisplatin(4) and UCN-01 (400 nM 17-AAG, U937 cells)(5). Looking for more information on HSP90? Visit our new HSP90 Scientific Resource Guide at more. Bibliography 1. Neckers L. (2002) Trends Mol Med. 84: S55-61. 2. Kamal A., et al. (2003) Nature. 425: 407. 3. Solit D.B., et al. (2003) Cancer Res. 63: 2139. 4. Vasilevskaya I.A., et al. (2003) Mol.Pharmacol. 65: 235. 5. Jia W., et al. (2003) Blood. 102: 1824. Representative figure legend Chemical structure of 17-AAG (SIH-100), a Hsp90 inhibitor. CAS #: 75747-14-7. Molecular Formula: C31H43N3O8. Molecular Weight: 585.7 g/mol. Chemical structure of 17-AAG, a Hsp90 inhibitor (SIH-100). CAS # 75747-14-7. Molecular Formula: C31H43N3O8. Additional description Tissue, pathway, proteinase, peptidase, protease ,acrosin, lipoprotein, activator, caspase, trypsin, papain, esterase inhibitors are proteins or receptor ligands or receptor antagonists that bind to an enzyme receptor and decreases its activity. Since blocking an enzyme's activity can kill a pathogen or correct a metabolic imbalance, many drugs are enzyme inhibitors. Not all receptor antagonist that bind to enzymes are inhibitors; enzyme activator ligands or agonists bind to enzymes and increase their enzymatic activity, while enzyme substrates bind and are converted to products in the normal catalytic cycle of the enzyme.